I spent the New Year’s weekend 2011/2012 with over 300 Evolutionaries from around the world at the Integral Spiritual Experience #3 in Asilomar, CA and had a blast! Our theme was “Kosmic Creativity — because life isn’t about finding yourself, it’s about creating yourself”. 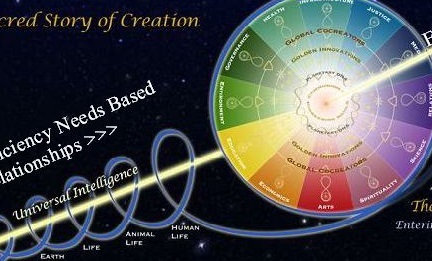 With the graphic below, Barbara Marx Hubbard illustrated for us how evolution advanced from the Big Bang in the lower left to the UNIVERSE, EARTH, LIFE, ANIMAL LIFE, and HUMAN LIFE, and how it is now on us to become authentic evolutionary GLOBAL COCREATORS in one or more of the segments in the big circle (Justice, Health, Arts, Economics, Education, Spirituality, Media, etc.) to move us towards a UNIVERSAL HUMANITY with INFINITE POTENTIAL. We listened to Ken Wilber and many other inspiring teachers/artists such as Andrew Cohen, Alex and Allyson Grey, Michael Dowd, Terry Patten, etc. and worked with each other to identify the Kosmic Creativity or “advancement into novelty” that wants to emerge through our authentic self (see Andrew Cohen’s important new book Evolutinary Enlightenment) and how to manifest it in the world. Through my own inquiry and listening to others I realized how many authentic Evolutionaries feel stuck, frustrated, stressed, trapped, burned out, and may even go broke while trying to serve others and making a living doing so. The reason is hidden in Barbara’s graphic above: If you look closely you note the common category error to place “Relations” as one of the segments instead of seeing that (1) relationships brought us here through one Billion years of sexual selection and pro-creation, (2) that relationships pervade and inform all other segments (see Kenneth Gergen’s argument in “Relational Being” that there is actually no self-awareness or creativity outside the context of relationships) and (3) that relationships are essential for effectively manifesting our authentic advancements into novelty at all levels of our being. As Ken Wilber said: Relationships go all the way up and all the way down! The brilliant Barbara Marx Hubbard herself gives us a pointer in an earlier interview with www.womenontheedgeofevolution.com how to solve this problem: “I have always been inspired by the great men who were evolutionaries. They were all men! I was attracted to their ideas and their seed, and it awakened in me the feminine co-creator.” Aha! 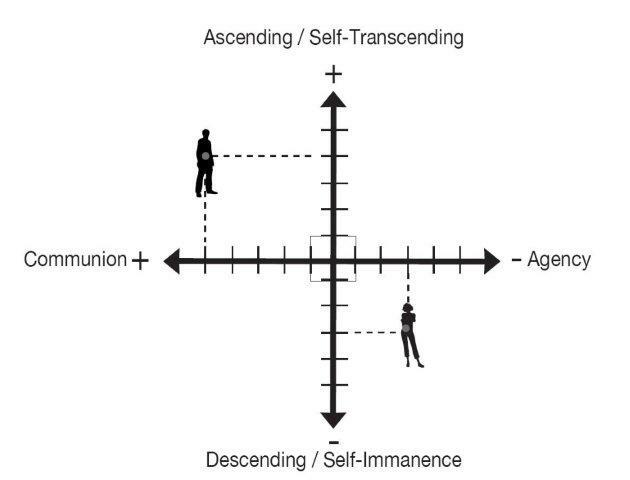 Individuals (holons) can only share their gifts and co-create with others effectively (having a long-term positive effect) by balancing and harmonizing the healthy feminine and masculine polarities of agency, communion, ascending and descending in all four quadrants (body, mind, culture and environment) with an equal and opposite partner. Otherwise they cease to exist over time. Since we can only occupy one of the two feminine and masculine polarities at a time, it is very ineffective and tiring to constantly go back and forth between them without a balance on the other side. This creates stress with elevated levels of cortisol and adrenalin, especially in women (see John Grey, Why Mars and Venus Collide, page 54) and burns us out. It is like playing checkers or being on a seesaw on our own. In one of the afternoon breakout sessions at ISE, Brian Whetten, who received a Ph.D. in computer science from UC Berkeley and a M.A. in Spiritual Psychology from the University of Santa Monica (he was there with his wife and little daughter), confirmed this insight when he showed us how we get trapped in the shadow between the feminine and masculine polarities (which was a new insight for me), procrastinate and burn out, as he did twice. When he asked how many are in a relationship, only a few hands went up. When he asked how many would like to be in a relationship, most of the remaining hands went up. We seem to know intuitively that it takes co-created Integral relationships to have the necessary impact in the world to effectively share our Kosmic Creative impulse and to move us forward towards the Universal Humanity and Infinite Potential that Barbara calls us to, without burning out. But only very few know how to co-create such a relationship and keep muddling on in frustration on their own, hang in an unproductive/unfulfilling “partnership”, or move from one partner to the next (which, as you know, saddens and frustrates me to no end). This is why co-created Integral Relationships between opposite and equal partners who make an explicit agreement to heal, learn, grow awaken and co-create together at all levels of the seven chakras are soooooo vital for a sustainable and peaceful evolution of all humanity. With Integral Relationships: A Manual for Men we now have the Integral map to co-create such relationships, so no more need to go it alone.